With the help of the Lady Bird Johnson Wildflower Center and Texas State University Department of Biology, the Ranch has established and sampled 21 permanent transects that cover a total of 6,300 meters of vegetation. The objective of this monitoring is to document the conditions prior to a management practice and to detect trends in revegetation after the treatment. 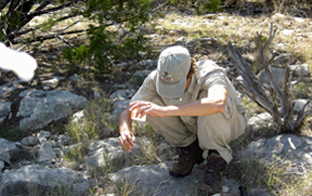 A biology graduate student from Texas State University samples vegetation along a transect. Since 2003 the Browning Ranch has cleared over 900 acres of Ashe juniper under cost-share programs with the TSWCB – Water Supply Enhancement Program and the Texas Forest Service Forest Land Enhancement Program. In 2003 the Browning Ranch collaborated with the Lady Bird Johnson Wildflower Center to conduct research on revegetation strategies for brush-pile burn sites. The objective of this study is to determine the most effective method for promoting post-burn vegetative regrowth while preventing the invasion of exotic species. Monitoring six test areas, we determined that brush-pile burning destroyed latent seed but not soil, leading us to believe that the best strategy for renewing a burn site is by disking and reseeding. Additional vegetation monitoring is focusing on the rate of grass regrowth underneath Ashe juniper that has been cut and left in place, as opposed to an area where the juniper has been collected into large burn piles. The objective of this study is to determine whether the creation of a "cut-and-let-lay" blanket of juniper provides more favorable conditions for grass regrowth than an area where the "cut, pile, and burn" method is applied. Initial observations indicate a decrease in soil erosion and an increase in the total amount of vegetation under the juniper blanket. In 2003 the Travis Audubon Society began a biannual bird census to determine the number and species of birds on the ranch. This survey follows the ranch roads, stopping for five minutes every three-tenths of a mile. In 2004 the Browning Ranch hosted a research project with Texas A&M University Department of Ecosystem Science and Management and the Texas Agricultural Extension Service to document the biological diversity and hydrologic conditions of Honeycut Hollow Creek. Subsequent investigations with the Texas Parks and Wildlife Department continue to find an active and diverse stream-life community, owing to the consistent hydrologic conditions. In 2004, the ranch hosted a class from Texas A&M Universitys Department of Wildlife and Fisheries Sciences that created a Wildlife Management Plan for the ranch. Since then, ranch staffers have created thirty-eight nesting structures, five additional watering sources, and eight year-round feeding stations. 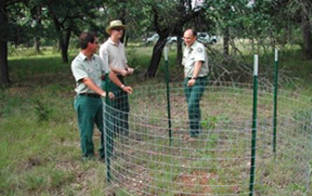 White-tailed deer management is a year-round component of land management in central Texas. Quarterly spotlight counts, previous years harvest data, and browse surveys are used to set annual management goals in order to maintain a healthy deer herd and protect against overbrowsing. Ranch volunteer ignites the flank fire on a prescribed burn. 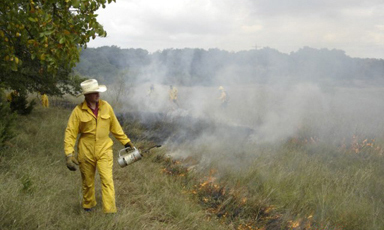 In 2005 in collaboration with the Lady Bird Johnson Wildflower Center, a prescribed burn was conducted on more than 20 acres within an old agricultural field. Vegetation sampling was made prior to the burn in an effort to gain information about the effect of controlled seasonal fires on the balance between native and invading grass species. An ancillary project was conducted by Trinity University to assess the impact of a growing-season fire on fire-ant populations. In 2007 the Browning Ranch initiated a long-term study to assess the effect of removing Ashe juniper on the presence of water in the seeps and tributary creeks within the Honeycut Hollow Creek watershed. Under the guidance of the Texas Water Development Board, the U.S. Geological Survey (Honey Creek SNA project), the University of Texas at Austins Department of Geosciences, the University of Texas at San Antonios Department of Geological Sciences, and Texas A&M Universitys Department of Ecosystem Science and Management, we are placing instruments in four tributary watersheds to collect information on stream flow, rainfall, evaporation, transpiration, infiltration, soil moisture, and climate data for the next twenty years. The various watershed areas into which the ranch has been divided will receive different kinds of treatment ranging from no juniper removal to extensive removal combined with different burning practices. This long-term study will help determine the comparative effects of the treatments on vegetation and water quantity and quality. In 2007, the San Antonio Center for Water Research of the University of Texas conducted a geophysical assessment of the ranch using seismic surveys, resistivity surveys, and well logging. This information, combined with hydrogeological field observations, will lead to a conceptual groundwater model illustrating how water moves through the subsurface of the Browning Ranch. In 2007, in association with the U.S. Geological Survey and the Blanco-Pedernales Groundwater Conservation District, the ranch conducted a Gain/Loss Survey on Honeycut Hollow Creek. This assessment, which included detailed flow measurements at multiple sites during wet and dry conditions, will determine where along the creek a gauging station could be located.